Developer Quote: "PlayUp is where friends and fans can cheer, rivals can heckle, or the couch athletes can just get down to talking match strategy. Share the experience with free messaging to friends and fans all over the globe." You might be thinking, "Not another social network app," but keep reading because this one really is a lot of fun. Concentrating solely on sports, PlayUp lets you connect with your friends and other fans while your favourite sports match is actually happening. It is the first social media platform dedicated to nothing but live sports, and covers a staggering amount of different sports from across the world. In fact, over a year it covers more than 20,000 live games from a variety of major world sports. 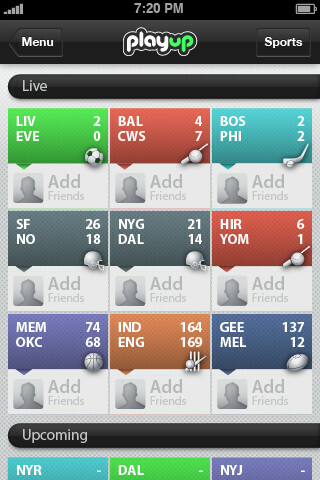 No other app comes close to covering the sheer amount of events this app does. Whether you want to follow golf, cricket, soccer, basketball, PlayUp will give you live updates of a sporting event and let you message other fans logged in. There are public rooms for you to enter and join in with a large group of supporters and fans chatting about whichever sports match it is for. In these rooms you can join in the banter and see what everybody’s opinion is, without being at the stadium, or even watching the game of television. If you want to just chat amongst your friends and avoid trying to keep up with everybody in the public room, then simply create a private room. 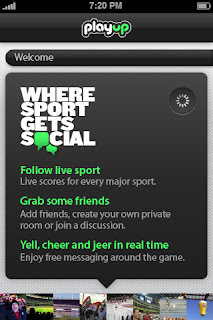 Link your room to whichever sporting event you want to follow then invite some friends. All the latest updates and scores will be fed directly to your private room so you know what is happening instantly. You and your buddies will all be able to comment on the action as it happens, and you can see what everybody has to say. You can also invite all your Facebook friends to join PlayUp and get involved in the action. Before you know it, you could be chatting about darts with your old boss, or laughing at your university pal because his football team just lost the important game of the season. The app has a powerful real time messaging service that makes sure your message gets to your buddy instantly, even if he is half way across the world. Things change quickly in sports, and the developers have made sure that your message is posted as quickly as a ball is passed. Instead of using separate apps for different sports, like one for ice hockey, one for football, another for baseball, you can find everything with PlayUp. The Live Now screen displays everything that is happening in the world of sport from across the globe, with regular updates to keep you in the loop. It doesn’t matter whether it is local sports teams or international matches, PlayUp seems to have it all! 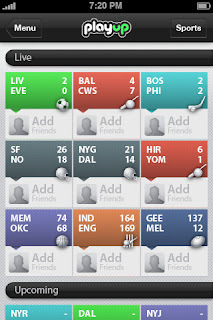 COOL CONCLUSION: PlayUp lets you feel like you’re at a live sports event when you can’t make the real thing. Curse and cheer all in real time, even when you can’t watch on television!